Reid Travel has established a reputation as one of the world's premier travel agencies for luxury cruising and international travel. From its base in Boca Raton, Florida, the Reid Travel Team's experience and reputation for excellence attracts clients from around the globe. Depending on where you reside, fall is coming to an end and winter has arrived. With it comes Thanksgiving - a time to give thanks and enjoy the festivities this holiday brings. Those of us at Reid Travel want to thank our devoted travelers who have depended on us to advise and assist in planning memorable journeys around the world utilizing all modes of transportation. Without you, there would be no Reid Travel. We join with you in extending our condolences to the families and friends who have suffered a loss in the horrific tragedy in Paris on November 13, 2015. Yes, any of us could have been there because: we travel. 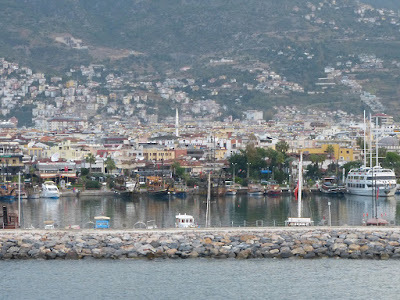 I returned the week before from a two-week cruise in Greece and Turkey(see blog post). As a matter of fact, one of our ports was Antalya where President Obama attended The Group of Twenty (G20) forum for global economic and financial cooperation that brings together the world's major advanced and emerging economies, representing around 85% of global GDP. Janet returned a few days after me from ten days in Croatia, Greece and Turkey; Julia returned this week from Germany and Morocco; Frances from Austria, Czech Republic, Germany and Slovakia. We are grateful for these experiences and will share them in future posts. 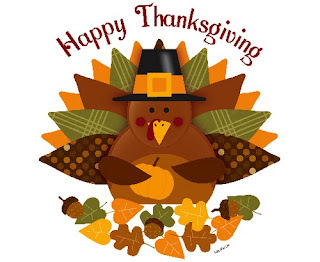 Enjoy the holiday as you relax and linger with family and friends (throw in some football! ), and let's hope that all nations can come together in our search for peace. Planning for future travel begins in the present. This may be a good time to discover the good ol' USA. An abundance of historical highlights and surprises await in our own backyards. Once a center for the cult of the Greek goddess Aphrodite, Cyprus is a modern island nation that retains an essentially Mediterranean character. Vestiges of the diverse cultures—Greek, Phoenician, Assyrian, Egyptian, Persian, Roman, Byzantine, Venetian, Ottoman, and British—that have either ruled or breezed through, dot the island. From turret to dungeon, we explored The Castle of Lemesos whose purpose was to guard and protect both the port and the city. Today, the castle houses the Medieval Museum of Cyprus. Saw just enough to appreciate never having to live in a castle. Shopping was easy so I bought a few items only to discover that they were made in China. Lunch at “The Antique Restaurant” provided a delicious prawn dish. Just enough to satisfy us until dinner tonight in La Terrazza. 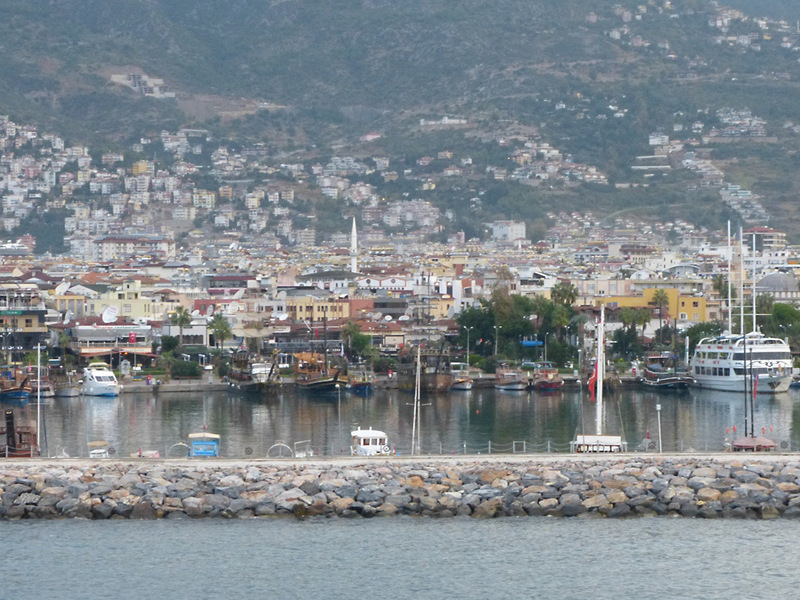 Alanya is an old pirate stronghold with lots of pirate-like sight-seeing boats along the quay. The old town dates from Seljuk and Ottoman times. Literally, Turkey’s hottest resort town—temperatures are higher than almost anywhere else in Turkey—the best swimming place is known as Cleopatra’s Beach. Prior to Seljuk rule in 1221 the town was given to Cleopatra by Antony. Called the Turquoise Coast, all the right elements come together to make this sun-drenched Mediterranean town on the Turkish Riviera a major holiday resort. Today was a day for rain, but not until the afternoon. We took the shuttle bus to the old town. There are minarets all over and many mosques as well. There is a clock tower and fortress ruins all about. 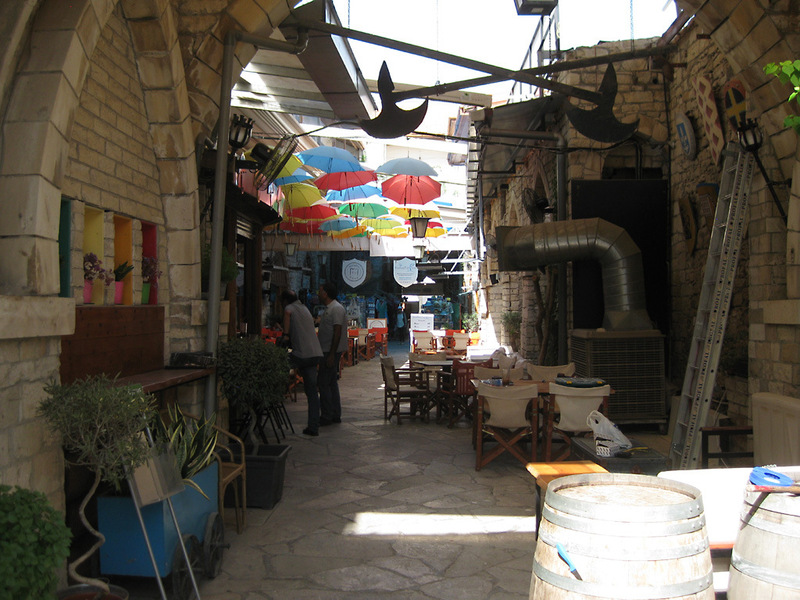 In the upper city there were traffic-free walking streets; great for shopping and, again, gelato; and, an Istanbul bazaar-like shopping complex of streets in which one can easily get lost. Can you think of a better place to be lost? Because of the weather we chose not to go to Perge where you will find the biggest stadium in Asia Minor. The Archaeological Museum houses the original bones of St. Nicholas (you can say you met Santa Claus). Early travelers described Rhodes as a town of two parts: a castle or high town (Collachium) and a lower city. Today Rhodes Town—sometimes referred to as Rodos town—is still a city of two parts: the Old Town, a UNESCO World Heritage site that incorporates the high town and lower city, and the modern metropolis, or New Town, spreading away from the walls that encircle the Old Town. We walked from the Spirit along the waterfront and into the walled city. It was like going back in time. Architecturally, arches abound in the Old Town. Our mission was to find a synagogue that was shown on a map provided by the ship. We found it, but it was closed. Why on Shabbat was it closed? Maybe there is a secret entrance for only locals? Many restaurants are in the town center where owners use parrots as shills, posing them on your shoulder in the hope that you will frequent their restaurant. Tonight is the second formal night so back to the ship for lunch and enjoy more of what the Spirit has to offer. Called Kallisti (the Loveliest) when first settled, the island has now reverted to its subsequent name of Thira, after the 9th-century BC Dorian colonizer Thiras. However, today it is better known as Santorini, a name derived from its patroness, St. Irene of Thessaloniki, the Byzantine empress who restored icons to Orthodoxy and died in 802. Our previous visit to Santorini was in July 2001 which is really the peak time to do so as it just glistens in the sunlight as you view it from the ship and the ship looks like a toy when viewed from Santorini. The end of October is the end of the tourist season and the locals change from jobs in tourism to jobs in construction and other alternatives. No construction is done during tourist season. We learned this during a bus ride on our tour to the city of Oia (pronounced Eea). 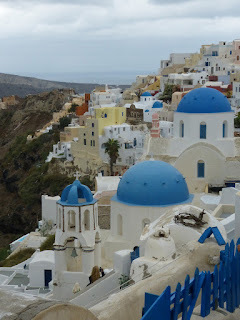 Oia is at the top of the crescent of mountains which are all that remain of what was the round island of Santorini. The rest of it was consumed by volcano. Magnificent views of the caldera and the rest of the smaller islands we saw on the drive to Oia made up for the less-than-desirable cloudy, windy day. All so different from our previous visit. The worst day aboard ship: saying good-bye to our butler and his assistant; the devoted crew waiting to wish us a safe journey home; new friends that we may never see again; long flights to our homes. We had to overnight in Athens as our flight leaves at 6:30 A.M. The Sofitel Athens Airport was the place to stay as we could literally walk across the street to the airport. Too bad we couldn’t stay longer to enjoy the huge suite provided for us. Because we had to be at the airport so early we couldn’t take advantage of the complimentary breakfast, but we did enjoy a delicious dinner in the hotel with friends from the ship who were on their way home to the Halifax area. While waiting at the Miami airport to begin our journey, a friend called and asked if I would have wi-fi on the ship. Knowing that complimentary wi-fi is available, I said, “Yes, why?” She said, “so that you won’t be bored.” Did I sound bored? Give Reid Travel a call; we’ll help you plan an exciting and memorable journey.